The Maryland Health Information Management Association and DC Health Information Management Association are holding a joint annual meeting on Wednesday, April 17th and Thursday, April 18th at the Royal Sonesta Harbor Court Hotel in Baltimore, Maryland. We would love to have your company exhibit as one of our vendors for this two day event. MdHIMA and DCHIMA are professional associations representing health information management professionals who work throughout the health care industry. These professionals represent multiple areas of health information management. This event will provide an excellent opportunity to contact new clients and build existing customer relations. We are very excited about our 2019 Annual Meeting and look forward to having you join us for the event. We realize time spent in the exhibit area is crucial to your business; therefore we have structured the exhibit area activities to provide maximum traffic flow and opportunity for contacts with your potential and current customers. If there is any way we can help you prepare for exhibiting as a vendor, please feel free to contact us via email. You will have the opportunity to select your booth during registration. First come, first serve. Pick your location today! Click here to view the Vendor Space Diagram. If you are not exhibiting, but would like to purchase sponsorship, please complete the exhibitor registration form. Company name will be featured during meals. 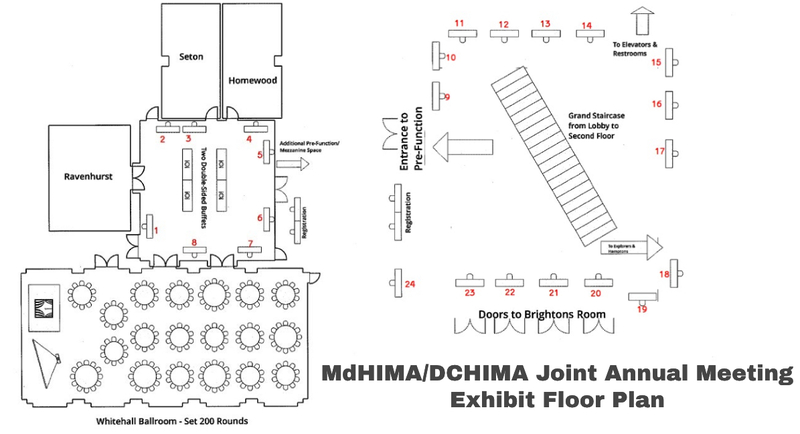 MdHIMA offers many opportunities to sponsor events at the Annual Meeting. Sponsorship opportunities are listed on the exhibitor registration form. Silent Auction donations are especially appreciated. All proceeds from this fundraiser go toward scholarships for our student members. If you have a silent auction donation please register on MDHIMA website. To learn more, click here. The deadline is April 1st to order Advertising. Online registration will close at 11:59 PM ET on April 12, 2019. Onsite registration will NOT be available.